Even though I felt like China was strange, when you look at the world’s population as a whole, you can barely call a place like China “different” at all. In fact, (according to the CIA World Fact Book), the average living human is a 28 year old Han (the most common ethnic group within China) Chinese man. This means that for most of the world, Jingzhou China seems quite normal! What does life there look like? Instead of having wooden houses like we do, most of the buildings in China are made of concrete. In the winters it can get very cold, but only the coldest parts of China in the North build heating systems into their buildings. (This is one of many things that the government controls.) Because of this, when we visited a classroom in China, the students all kept their coats on the entire lesson. At home, they may have a small heater of some kind in a main room, but may still keep their winter coats on here as well. While they may eat some home-cooked meals, there are markets everywhere full of food and many will simply eat their meals from the market. These markets were always full of people. Noodles, dumplings, and fried rolls filled with vegetables and meats can be found everywhere as well as fresh ingredients and raw meats for cooking. Inside a restaurant, food is ordered then placed on a rotating table where it can be shared and passed to everyone. Dishes may include fried eggplant, chicken with cashews, fish, fried cabbage, pork, and much more. These dishes may sound like the food you find at a Chinese Restaurant in America, but it is actually quite different. In America our Chinese food may have sweet sauces on top. In China, the seasonings are simple and the dishes come without these sweet sauces. The main dish may likely be a big pot of boiling water with some kind of meat inside such as duck or fish. Everyone shares from this pot, reaching into it with their chopsticks. There are lots of people in China. Jingzhou had at least one million people, yet it was considered just an ordinary city. This has worried the government, so they encourage families to have only one child. They do this by raising taxes for having a second child and offering very few benefits for that child. There are a few exceptions, however. For instance, if a husband and wife were both the only child in their family, they may have a second child. In China it is not likely for a family to own a car. Instead they may own a scooter, bicycle, or motorcycle. We often saw motorcycles crammed with as many as four people! There is also a kind of three-wheeled truck that is a popular vehicle in China. Even though families often don’t drive cars, the pollution in china has gotten very bad, as well as litter. The outdoors are seen as very dirty, and people will sometimes where breathing masks when they are outside. This is also one of the reasons people take off their shoes before entering a house or building. School is very different in China than in the U.S. For instance, classes focus very much on memorization and test-results. Whether a student is learning English or math, they do this by studying and memorizing facts for a test. Many schools are newly experimenting with providing more interactive forms of learning, but this is still more uncommon than it is common. The class we visited was taught by an American teacher who taught the students English using actual conversation, debates, plays, music videos, etc. This was new for the students. Their parents too are very concerned with their actual grades so there is a big push to get a good score rather than to have a good understanding of a subject. Even a student’s eventual choice of college is determined by a test called the Gau Cau. This test is taken when a student finishes what we would call high school. The results of this test determine not only which colleges this student can attend, but also what subjects they should study. I heard of one student who wanted to be an artist, but her Gau Cau results were strong in finances, so she studied that instead. People in China give this test a great amount of authority. If a parent pays extra money, they can try to get their child into a different school than the school suggested by the Gau Cau, but it is very difficult and very expensive to do this. Another new education practice that schools are beginning to use is something called “English Corner.” More and more people are realizing that language can be a very difficult thing to learn by simply memorizing facts, without having actual practice. To improve this, they invite English speakers to meet at a specific public location each week to simply have conversation with English students. Some schools do this over a meal, while others simply have students and English speakers gather outside of the school building to talk. More and more schools are recognizing a need to do more than just memorize. 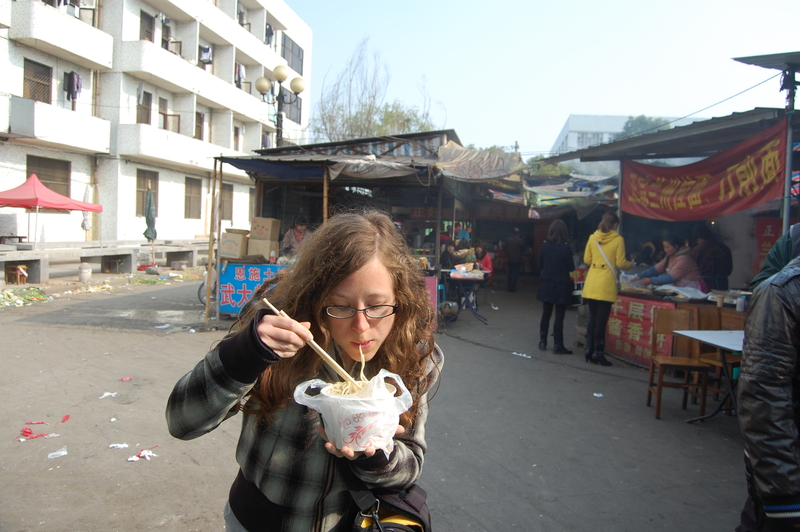 One student we met has a passion for changing China’s school system and adding more variety to the style of education. 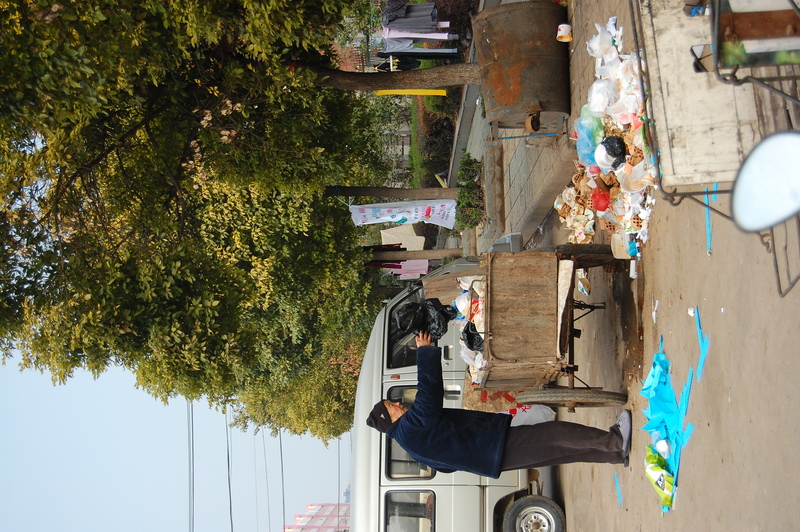 In lesser-developed cities like Jingzhou, there is no garbage truck to collect the trash. Instead, people dig through the trash that’s collected on the streets to collect recyclable items in hopes that they can turn them in for money. I was surprised by the trash in the streets and that people wear masks. Yes the people take off their shoes before entering buildings partially because they see the streets as so dirty: and the streets really are very dirty as there isn’t much of a trash system.